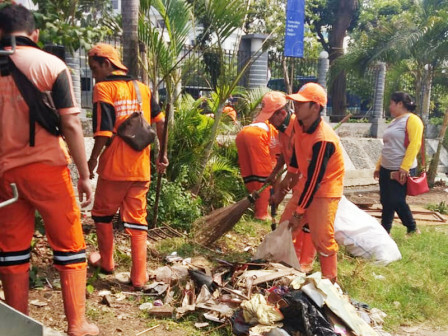 10 Pasar Baru PPSU personnel, Sawah Besar, Central Jakarta, clean up street gutters along Jalan Senen Raya and Jalan Kalileo.
" We clean the gutter from waste and soil sedimentation thus water can flow smoothly"
"We clean the gutter from waste and soil sedimentation thus water can flow smoothly," mentioned Agus Yachya, Pasar Bary Urban Village Head, Friday (10/26). Pasar Baru Urban Village's Economy Development and Environment Section Head, Dumaria Panjaitan mentioned, gutter cleaning is one of PPSU routine works ahead of rainy season. "Waste from this cleaning will be transported to Juanda Waste Disposal Site (LPS) temporaril y," she stated.